BURBANK, CALIF. -- The editorial employees of Nickelodeon Animation Studio have overwhelmingly elected to unionize with the Motion Picture Editors Guild, Local 700 of the International Alliance of Theatrical Stage Employees. Nickelodeon has agreed to recognize the editors’ union after an arbitrator verified that a majority of employees had signed union authorization cards. Nickelodeon Animation Studios produces animated episodic programming such as SpongeBob SquarePants, The Loud House, Rise of the Teenage Mutant Ninja Turtles and Shimmer and Shine. The Motion Picture Editors Guild is Local 700 of the International Alliance of Theatrical Stage Employees. Established in 1937, the guild now represents roughly 8,000 postproduction professionals working nationwide in live-action and animated television, features, and new media. The Nickelodeon Animation Studio today joined the International Alliance of Theatrical Stage Employees (IATSE) following the successful effort by editorial employees of Nickelodeon Animation Studio to unionize being welcomed by Viacom bosses, a move which is seen as a increasingly rare occurrence in Hollywood nowadays, reports Deadline. An independent arbitrator this morning signed off that a clear majority of the currently nearly three dozen NAS employees had inked union cards and sought IATSE and its Local 700, the Motion Picture Editors Guild representation. With that, Nickelodeon and parent company Viacom reiterated their decision not to challenge the move towards unionization. The timing of the move comes as the already strongly unionized Nickelodeon sees it's parent company Viacom in the midst of contentious potential merger talks with CBS. 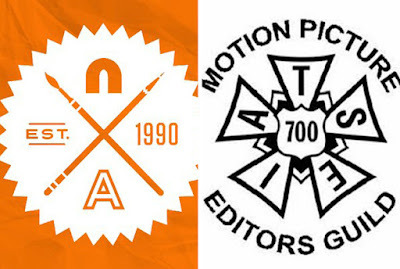 Now covering picture editors, recording engineers and dialogue editors, animatic editors, and machine room employees, this new collective step joins the IATSE agreements that NAS already has in place with the Animation Guild among others. It also is another feather in the 81-year-old Editors Guild cap to bring Hollywood workers into the collective bargaining fold. The editorial employees of Nickelodeon Animation Studio have elected to unionize with the Motion Picture Editors Guild, Local 700 of the International Alliance of Theatrical Stage Employees. The newly unionized positions encompass a range of pre-production and post-production roles. Recording engineers and dialogue editors record and arrange voice actors’ dialogue prior to animation. Animatic editors work in pre-production to assemble storyboards and soundtracks in a pre-visualization of the finished show. Picture editors cut the completed color animation. Machine room employees manage the elements and equipment used in the creation of shows. More Nick: Nickelodeon Upfront 2018 Full Coverage! Originally published: Friday, April 13, 2018. Follow NickALive! on Twitter, Tumblr, Google+, via RSS, on Instagram, and/or Facebook for the latest Nickelodeon Animation News and Highlights!